There are those who fall in love with Budapest at first sight and those who only come to love it after a longer introduction, but everyone will agree that this is one of the most beautifully laid out cities in the world. The powerful current of the Danube divides it into two parts, the hills and valleys of Buda on one side and the flatlands of Pest on the other. In spring, Margaret Island becomes a vibrant green patch on the blue waters of the river. There are caves, curative thermal springs and special conversation areas, all in a bustling capital city with a population of 2 million people. Among the things of historical interest to be seen in Budapest are the Roman era amphitheatre, the Turkish baths and the unique Hungarian version of secessionist architecture. Grand City Tour – Passing by the Parliament we cross the Danube through the Margaret-Bridge (Margaret-Island) and drive to the Royal Castle on the Buda side, where we visit the Fishermen’s Bastion (Promenade) and the Matthias Church after we climb to the Gellért Hill (Photostop), we cross Elisabeth-Bridge and drive towards Heroes’ Square (Promenade). Passing by the Opera and St. Stephen’s Basilica we reach Hotel InterContinental, where the tour ends. DANUBE BEND: The above term signifies the twenty kilometre long bend of the Danube and its surrounding environment, including the extensive holiday area. The „real” scenic Danube Bend begins at VISEGRÁD. The Romans built a fortress at the settlement located at the foot of the steep rocks of the Visegrád Mountains. The Lower and Upper Castle of Visegrád was built in the 13th century. The unique location of the thermal baths in Lepence warrants in itself a visit. The West Gate of Danube Bend is ESZTERGOM. Esztergom is the centre of the Hungarian Roman Catholic church. The city is also of historical significanc. St. Stephen, the first Hungarian king, was born here, he was crowned in this town in 1001. He founded the archbishopric of Esztergom. The main cathedral built in the 19th century is the largest church in Hungary. The South Gate of Danube Bend is SZENTENDRE. The tiny town squares, meandering streets, Serb temples, baroque bourgeois buildings contribute to a uniquely picturesque, Mediterranean atmosphere. 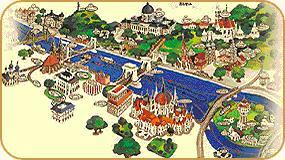 Today, Szentendre is the town of museums. Many museums and galleries exhibit the works of artists who lived or currently live in the artists’ quarter established in the past century. The Danube Bend – an excursion into Hungary’s history – we take you to Visegrád, the former Royal Residence and to Esztergom (Center of the Catholic Church) – after the interior visit of the Cathedral and Lunch (3-course menu) we carry on to the Baroque Artists’ Village Szentendre (guided walk) – we visit the magnificent Caprice Hungarian Jewellery Center – coffee and softdrinks - return to Budapest – the tour ends at the City Centre. GÖDÖLLÕ the 18th century central estate of the Grassalkovich counts, and transferred to the ownership of the king in 1867. The beloved queen of Hungarians, „Sissi”, enjoyed staying at the royal castle, it is an outstanding example of Central European baroque architecture. Today, the Castle Museum opens its doors to thousand of visitors. Excursion to Gödöllõ - Visit to the former Summer-Residence of Queen Elisabeth (Sissi) in Gödöllõ ( the second largest baroque chateau of the world) – interior visit – Walk through the park of the castle to the Royal stables and the Riding School – coffee & cake at the Palace Café. Return to Budapest – Tour ends at the city centre. Herend a world famous centre of porcelain - after a guided tour through the world’s largest Porcelain Manufacture (founded 1826), coffee at the "PORCELANIUM" - possibility for shopping - afterwards we drive to the Peninsula Tihany the famous nature reserve (interior visit of the Abbey, founded 1051) - then lunch in a traditional Csárda (3-course menu with wine) - drive to the oldest Spa, Balatonfüred (Promenade) - Return to Budapest - Tour ends at the hotel. Dinner in a typical Hungarian restaurant. The restaurant is decorated with rustic-style wooden chairs and tables giving the feel of a traditional Hungarian restaurant. Upon arrival you are greeted by the master of the house, who welcomes everybody with special fruit brandy and fresh salty scones. An unforgettable evening is guaranteed by gipsy music and authentic folklore show, as well as typical local dishes and a good selection of wines. Duna Bella is a daytime sightseeing cruise on the Danube. The boat tour departs from the center of Budapest. During the trip you are guided by the two parts of the city as "Buda" and "Pest" are telling you their fabulous stories about the charming curiosities along the river. This dialogue ends at the Margaret Island, where you have the possibility to participate in an hour walking tour. ( To skip the Margaret Island tour: stay on board! The ship stops only for 5 minutes. Those are walking, will return with the next boat.) Following the island break the boat turns towards the town again, but the show is not over yet. The final 15 minutes is full of suprises! House of Parliament – Take the opportunity for a visit of the impressive House of Parliament – after a walk around Hungary’s largest building, interior visit of the magnificent neo-gothic Parliament (Home of the Holy Hungarian Crown) with guidance through the splendid session room, the impressive staircase and the wonderful Great Vaulted Hall.